The veteran’s grave needed tending. Robust June grass encroached on all sides of the metal marker flush to the ground, where a small American flag placed at Memorial Day also designated his final resting place. He was among 4.7 million American soldiers and sailors, including immigrants like himself, mobilized in the early 20th century battle of 19th century European empires. It began with an assassination in 1914, and quickly escalated into a toxic mix of nationalism, imperialism and militarism. By the war’s end in November 1918, the casualty count was measured in millions, with nearly 117,000 U.S. fatalities and more than 200,000 U.S. wounded. John Ware, in 1918 or 1919. These were the dangers 31-year-old John Ware faced 100 summers ago as he joined the army and shipped off to the European front. Regretfully, I never asked him about his service before he died at age 96, when I was in my early 20s, a missed opportunity of long-ago Christmas dinners and other family gatherings. He was born in County Kerry, Ireland, near Ballylongford. He immigrated to Pittsburgh in 1910; worked as a streetcar conductor from the Frankstown Avenue car barn in the city’s Homewood district; and worshiped at Holy Rosary Catholic Church. Two sisters followed him to Pittsburgh. One wed another Kerryman, who became John’s brother-in-law and my grandfather. The other sister, like her older brother, never married. All four of these Irish immigrants are buried within a few feet of each other at Calvary. In June 1917, two months after America entered the war, John registered in the first round of the U.S. military draft. Men between the ages of 18 and 45 were required to sign up, both U.S. citizens and resident aliens who had filed a declaration of intent to become a citizen. John was already well into that process, and he was naturalized a month later. Immigrants who had not filed a declaration of intent were exempt from the draft, but many of them volunteered for the military. The federal government soon offered fast-track citizenship to these soldiers and sailors. The next morning, John and his address at 7115 Kelly St. were listed in the Pittsburgh papers with other “Names of Those Who Go.” That afternoon, he and 287 other area draftees entrained to Camp Lee, Virginia, a year-old combat training base south of Richmond. That spring, Irish immigrants and their supporters were making other headlines in Pittsburgh. On May 5, 1918, thousands gathered at the downtown Lyceum Theater to protest British conscription of their countrymen without the benefit of limited domestic political autonomy, called home rule. They passed a resolution calling on President Woodrow Wilson to demand freedom for Ireland. It was not only blood the Irish were sacrificing, O’Connor said, but also treasure. He told the story of an Irish workman earning $80 a month who had purchased $500 worth of Liberty Bonds, or half his annual salary. During the last week of June 1918, an Irish socialite known as the “Countess of Kingston” visited Pittsburgh to debut a traveling exhibit of war items: “German Uniforms, Helmets, Military Equipment, Hand Grenades, Propaganda Literature, Iron Cross, Lusitania medal, British Battleship Vindictive Souvenir, German Prison Bread, and a Wonderful Collection of British War Pictures,” according to newspaper promotions. The exhibit, staged at Kaufmann’s 11th floor auditorium, was intended to raise money for the Shamrock Fund, a charity for wounded Irish soldiers in the British army. Pittsburgh was selected for the debut because of the generous reception Lady Kingston received during a previous fundraising stop. As Pittsburghers visited the Irish war exhibit, John shipped off to Europe with the 145th Infantry Regiment of the 37th Division. The unit fought through the summer and fall. John’s record says he was in the Alsace Lorraine Sector, a disputed territory between northeast France and southwest Germany. 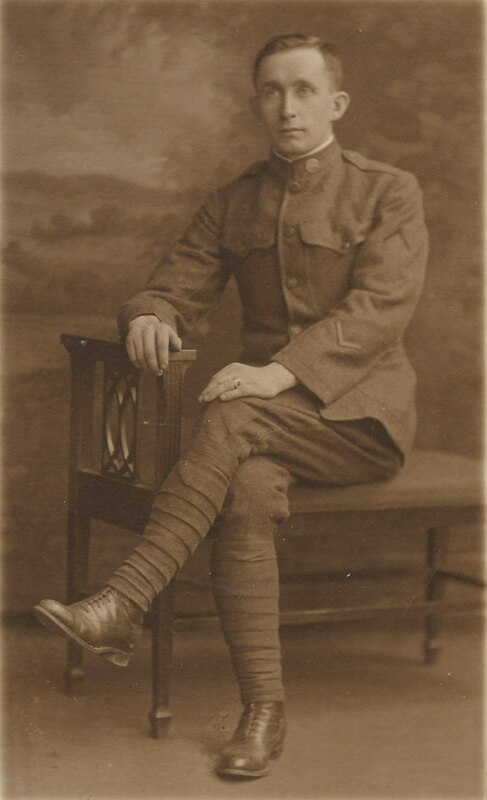 John’s tour of duty ended Jan. 30, 1919, about 10 weeks after the armistice. He was released two weeks later, on Valentines Day, from Camp Dix, New Jersey. The Army issued him $53.54 in travel pay (about $500 today) for the 350 mile return to Pittsburgh. Perhaps he remembered a similar westbound train trip as the last leg of his journey from Ireland nine years earlier. Like many soldiers, he sat for a photograph in his uniform. The image survives with his Honorable Discharge record. John returned to his streetcar job. For the next few years he read newspaper accounts of Ireland’s war of independence from Britain, which resulted in the island’s partition, and a brutal civil war. The following decades brought World War II, Korea, Vietnam, and the Troubles in Northern Ireland. John was luckier than tens of millions of soldiers and civilians in all those places. His 65 years after WWI was twice as long as the life he easily could have lost in France that perilous summer 100 years ago. Tending his grave at this year’s centennial seemed the least I could do. 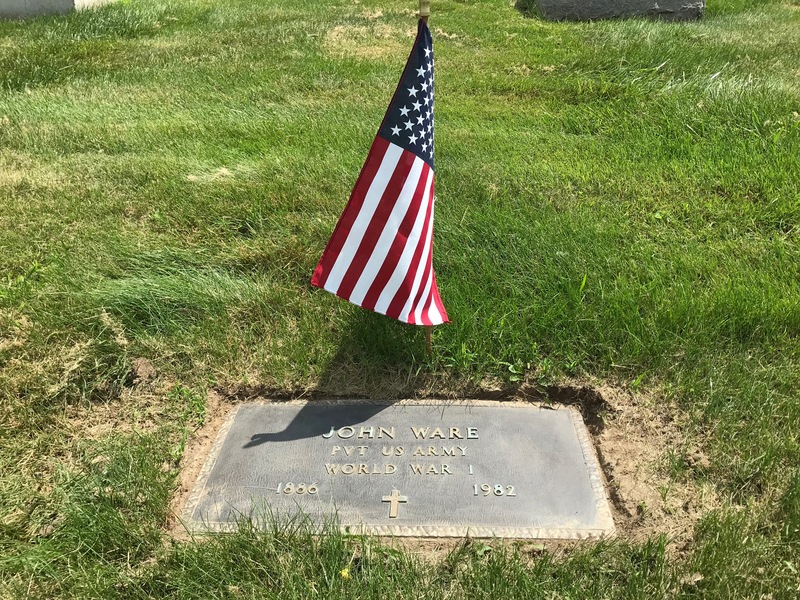 Grave of John Ware, Calvary Cemetery, Pittsburgh, June 2018. This entry was posted in History, Irish America and tagged County Kerry, World War I on July 18, 2018 by admin.